The Dream Den (夢の穴?, lit. 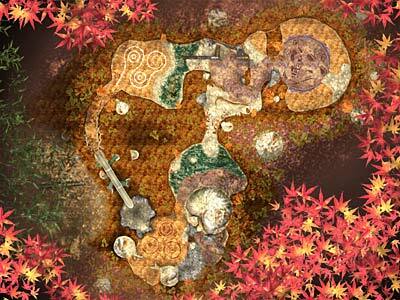 : "Hole of Dreams") is a cave in Pikmin 2, found in the Wistful Wild. Because of its location, difficulty, and the fact that it contains what may be regarded as the game's final boss, the Titan Dweevil, it is often the last cave completed. The cave is one of the game's longest, with 14 sublevels, and contains a variety of enemies in large quantities. The cave design is also relatively varied, with many previously encountered themes showing up here. In this cave, there is a total of 5965 Pokos for all treasures in the US version, and 5945 in the European version. There are no Bulbmin or Candypop Buds in this cave, so extra care should be taken. Warning: the following text contains major spoilers about the end of the plot in Pikmin 2. The final floor of the Dream Den is the location of Louie. He is found atop the game's final boss, the Titan Dweevil, and is afterwards collected as a treasure and added to the Treasure Hoard. He does not replace the President after having been rescued, however. To reach this cave, there are two methods. One can bring Pikmin through the Hole of Heroes area, or go directly. For the latter strategy, it is necessary to build a bridge by bringing Blue Pikmin across a water source, taking care to defeat all enemies. At least one poisoned black gate must be destroyed, and one respawning enemy (an Orange Bulborb or a Creeping Chrysanthemum) must be defeated or avoided. All Pikmin types should be brought along. If one intends to fight the Titan Dweevil on the first run, bringing more Yellow Pikmin is recommended. Like the Hole of Heroes, a water-logged sublevel is present, so sufficient Blue Pikmin are required. “Perhaps you will find Louie in here! ...And yet, my CPU is on edge. Ludicrous dangers await! Beasts lurk at the bottom of the deepest, darkest, most foul, sinister, horribly vile pit. ↑ The game files indicate that only 1 should appear, but 23 appear instead. The first level of the Dream Den harbors Dwarf Orange Bulborbs, two Hermit Crawmads and two Lesser Spotted Jellyfloats. There are also gas pipes. The enemies near the starting area, especially Dwarf Orange Bulborbs that are blocking paths, should be removed. Defeat the Lesser Spotted Jellyfloats (which may be near the starting area as well) the usual way. They will digest one Pikmin every thirty seconds. Once the area is clear of any obstructive enemies and gas pipes, the Disguised Delicacy can be taken back. Use Pikmin to destroy the Clog on the hole, allowing you to continue down to the next sublevel. There is a Gatling Groink on a raised platform that will start to attack the player as soon as the sublevel begins. Hide the Pikmin behind the wall of blocks, send one of the leaders out to distract the Groink, and attack with your Pikmin. Alternately, beat up the Snow Bulborbs and Hairy Bulborb with the fists of a leader or let the Gatling Groink kill them with its projectiles. To defeat the Groink, position a leader against the base of the platform it is standing on. 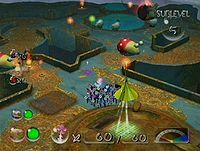 With the other leader, take a group of Yellow Pikmin, and while the Gatling Groink is distracted, walk up the slope and attack it from behind. The Manual Honer, which was held by the Gatling Groink, and the Implement of Toil, which is usually located somewhere close to the wall of blocks, are found on this level. This sublevel is filled with falling bomb-rocks, electrical wires, gas pipes, and Dwarf Bulbears. There are also some Careening Dirigibugs that throw bomb-rocks. Somewhere in the level, a Spotty Bulbear will fall from the sky. This creature contains a treasure. 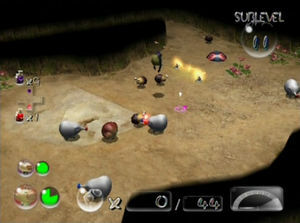 Pikmin or the leaders can be used to kill it; the player can also trick the Bulbear into falling off into the abyss (as the Bulbear will always take the most direct path towards the leaders), by making the Bulbear walk towards the leaders with a gap in between; subsequently, it will fall into the pit. Its treasure, the Glee Spinner, will drop right where the Spotty Bulbear was before it fell into the abyss. Note that the bomb-rocks and Spotty Bulbear will only fall when Pikmin are near. This sublevel is filled with Armored Cannon Beetle Larvae and Anode Beetles. While the positions of the Armored Cannon Beetle Larvae are constant, the positions of Anode Beetles and gas pipes are variable. There are a few strategies you can use to safely get through this level. One is to simply dismiss the Pikmin and take a small group of Purple and White Pikmin with one of the leaders. The purples are then used to kill the enemies and the White Pikmin to disable gas pipes on the way. Another method is to dismiss all your Pikmin and just take one or both of your leaders out and try to trick the Armored Cannon Beetles into shooting the others of their own species and gas pipes. Once done with killing the Armored Cannon Beetle Larvae, the player can send in yellows and whites to kill Anode Beetles and disable gas pipes, respectively. After the coast is clear, retrieve the Mirrored Element (you may want to follow your Pikmin back, just in case). Another, much faster and easier way, albeit more dangerous, is to bring fifteen White Pikmin and run through the level, ignoring everything, and get them to carry the treasure. The White Pikmin should be able to carry it back without any dying, as they carry treasures very fast. It should be noted that when an Anode Beetle is near the edge, Pikmin may bounce off the edge when thrown onto it. This sublevel is littered with fire hazards and also contains a Fiery Bulblax. There are also two Red Bulborbs, Fiery Blowhogs, and a Withering one as well. Red Pikmin can easily disable fire traps and defeat any Red Bulborbs, Fiery Blowhogs, or Withering Blowhogs. When throwing Pikmin on a Fiery Blowhog, make sure it doesn't face the edge, or it could throw Pikmin into the abyss. 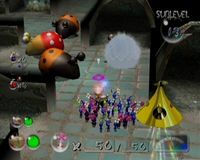 The Fiery Bulblax can be killed with the same technique used on the Spotty Bulbear on sublevel 3. It will drop the Insect Condo. You start near an alcove. There are three Armored Cannon Beetle Larvae, one Greater Spotted Jellyfloat, and one Lesser Spotted Jellyfloat. Armored Cannon Beetles can be used to kill each other with rocks. The sinkhole will affect the path of the rocks. Pikmin can be used to kill the Jellyfloats, but the larvae can also shoot them with the rocks. It works best with the Greater Spotted Jellyfloat, due to the fact that when it lands after sucking up a leader, it is an easy target for the Larvae. Remember to escape from the creature, or you will take damage. After they are killed, grab the Future Orb the Greater Spotted Jellyfloat left behind, break down gates with Pikmin to get nectar eggs, and continue down the hole which may be inside a gate. This is a very small level, but it contains several Bumbling Snitchbugs and Careening Dirigibugs, some of which may begin in your starting area. There are also two Puffy Blowhogs, one of which contains the Essence of Desire. When the treasure is collected and the coast is clear, the clog on the hole must be removed to continue downward. *The game files state that Fiddleheads appear, but the cave layout can never contain plants. This sublevel is filled with Dweevils of all types, as well as fire, electrical and poison hazards. There is also an Antenna Beetle which can easily be stunned by a Purple Pikmin and killed by swarming. There are two ways to kill the Dweevils and to reach the treasure. One is to dismiss the Pikmin and go out with one leader to kill them (this doesn't require much time with the Rocket Fist upgrade). The other is to go out with the entire army, using Purple Pikmin to kill the Dweevils (calling them back if they get into danger), and using Red, Yellow, and White Pikmin to disable hazards. If you can quickly call them back, your only real hazard is keeping them away from electrical wires and the shocks of the Anode Dweevil. The Extreme Perspirator and the Possessed Squash, which are anywhere above ground but usually in dead-ends, are found here. Sublevel 9 is the only rest level in the Dream Den. Several underground beetles reside here: one Iridescent Flint Beetle, one Iridescent Glint Beetle, and two Doodlebugs. Use Purple Pikmin to flip them easily with the help of their area-effective throw, or White Pikmin on the Doodlebugs for the safest approach. The bugs will drop lots of nectar and sprays. There are no treasures here so just continue down when you're ready, or use the geyser if you're in need of it. Ultra-bitter sprays are recommended here. Simply resetting the game and waiting for a better layout is a good tactic for this level if the enemy spawns are impractical, for instance, if an enemy spawns near the starting area. With one leader and no Pikmin, go out and find a Gatling Groink as soon as possible. Beat it up with your fists, and make sure to periodically check on the Pikmin, because sometimes a Lesser Spotted Jellyfloat will come over to your starting platform and start eating them. 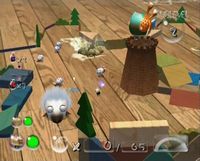 Another strategy is to use the Gatling Groink's projectiles to kill Fiery Blowhogs, Water Dumples, and Wollywogs; however, this can take a long time, and enemies may have more than enough time to sneak up on your Pikmin. If you have a spare ultra-bitter spray, you can use it on the Gatling Groink when its health is three-fourths gone; if you can defeat it while it is frozen, you won't have to take the regenerating body back to the ship. The lone treasure, the Talisman of Life, is inside a Lesser Spotted Jellyfloat, usually far away from the starting area; Blue Pikmin might be necessary to reach it. However, if you don't have 15 blues, there is actually a trick you can use to get the treasure, as long as you have two Purple Pikmin. To execute the trick, you must line up some dead enemy carcasses near land. Then, you want to get the Jellyfloat with the treasure as close to land as possible when it is defeated, so that when its treasure pops it, the carcasses beneath it make it bounce toward the land instead of away from it. Then take back any enemy carcasses you want, and continue down to the next level. This sublevel has both Fiery Blowhogs and Watery Blowhogs, some Dwarf Bulbears, gas pipes, Cloaking Burrow-Nits, a Breadbug, and a Bumbling Snitchbug. Electrical wires are also usually encountered in this level, sometimes placed in bizarre locations such as on top of a stump. Sometimes the Cloaking Burrow-Nit will be near the gas pipes, so the pipes will be difficult to disable without having Pikmin eaten. The best way to clear this level is to take all of the Pikmin and eliminate one threat at a time. Both treasures, the Boss Stone and the Yellow Taste Tyrant, can be anywhere above ground, but usually on a high ledge or in a dead-end. Use yellow Pikmin to get it. Collect your spoils, break the clog on the hole, and go down. There is an Antenna Beetle in this level, messing with the treasure gauge. There are also Wollywogs, Orange Bulborbs, gas pipes, and falling rocks. If an enemy is near a gas pipe, ignore the pipe and continue. Once all the gas pipes are out of your way, you should lure any Wollywogs that were near gas pipes away, and pelt them with Purple Pikmin. Once these die, use Whites to take down the remaining pipe and use Purples to defeat all the enemies. If you can defeat the Antenna Beetle, finding the underground treasure in this sublevel will be much easier. There is also a treasure inside one of the Orange Bulborbs, so unless an enemy is in your way, defeat the Antenna Beetle first so you can easily find the treasures. Once all the gas pipes and enemies in your path are cleared out, take back the Stringent Container which was inside the Orange Bulborb, and use your treasure gauge to find the underground treasure, the Universal Com. Look for the hole and jump down. This level is small, but cramped with adult Bulborbs. There are two Orange Bulborbs, two Red Bulborbs, and two Hairy Bulborbs. Inside one of the Orange Bulborbs is a treasure. The treasure gauge can be used to find the Bulborb with the treasure. If that Bulborb is dangerously close to another Bulborb, an ultra-bitter spray could be used and both creatures, followed by bombarded them with volleys of Purple Pikmin. The Hypnotic Platter will be dropped by the creature. Clear the way back, deliver the treasure and enter the final hole. See also: Titan Dweevil strategy. Note: 30 or more Pikmin must be left in order to carry most of the treasures back to the ship; three Purple Pikmin will also suffice. This is the last sublevel in the cave, and home to the Titan Dweevil. The sublevel has a sink-like appearance with the boss in the center. There is a geyser available on this level that can be used to return to the surface without fighting the boss. There are several strategies that suggest this. Returning with almost 100 Yellow Pikmin is a strategy commonly used for a speedy defeat. An in-depth guide on how to defeat the Titan Dweevil can be found in the link above. The treasures the Titan Dweevil drops are the Flare Cannon, the Shock Therapist, the Comedy Bomb, the Monster Pump and the King of Bugs. The Dream Den is located where the first ship part of the S.S. Dolphin, the Main Engine, is found in Pikmin. A vast amount of firefly-like insects appear on the final floor of this dungeon. No information about them is known however. The final floor's layout is commonly thought as being based on a GameCube. In fact, it is nothing more than a kitchen sink. The Official Nintendo Power game guide states that several early bosses return in this cave, like Man-at-Legs, Empress Bulblax, and many others. However, none of these bosses are found here. The Hole of Heroes on the other hand has most of the previous bosses. According to the name of the unit definition file, it is possible that sublevel 11 uses the same general layout as a cave that had been previously presented at E3. It is the only sublevel in the game in which this is the case. This page was last edited on January 20, 2019, at 12:20.